Donald Trump has locked horns with his own intelligence agencies and law enforcement. How damaging can the rift between the White House and the American intelligence get? We ask two-decade CIA veteran Rolf Mowatt-Larssen. Sophie Shevardnadze:Rolf Mowatt-Larssen, CIA veteran who served as Moscow section chief among other positions, welcome to the show. It’s really great to have you with us. The American intelligence community has been accused of being politicised many times - in the Bush years, the politicians used it to justify Iraq, and now the agencies are again embroiled in a political scandal. I know you pride yourself and your colleagues for being patriotic, non-political, but can you really be above politics in this line of work, that sounds fairy-tale almost? Rolf Mowatt-Larssen: I think it’s a standard you have to strive for. I’ve been lifelong political independent for that reason you outlined that it’s crucial for intelligence officers to be independent and objective and serve the country, not just the president and the government. But we’re also all citizens. SS: The intel bureaus are taxpayer-funded, they have no private sector competition, appointments there are made by politicians - how can all that not be politicised? RM: Actually in the intelligence profession all of our officers are career professionals, we spend our entire career inside the agency. In my case I was undercover for my 23 years in CIA living abroad for most of these years. And frankly I felt it was not that difficult to maintain my impartiality. And I think, you have to do that whether you are collecting information, analysing or disseminating it which is the essential mission of intelligence. You have to maintain an ability to tell your policymakers the truth. In other words, speak truth to power. SS: Is it right for an intelligence professional be vying for high political office - for example, the media in US are saying that director of the CIA, Mike Pompeo may be replacing Secretary of State Rex Tillerson soon. Is that steering too much into political territory? RM: There’s always a healthy discussion about the idea of, particularly, former intelligence professionals getting involved in politics. I personally don’t agree with that as a principle as for the same reason for military officers getting involved in politics. But Mike Pompeo was a representative who … And often our CIA directors are political appointees. And he is in a long line of CIA directors who are political appointees. That is the way our system operates. Just like many ambassadors overseas are aligned politically always with the president. So I don’t find that worrisome or disturbing. I think it’s much more important that the ranks of the intelligence officers remain professionalised. SS: How much freedom does the CIA have in its decisions? For instance, the Bush administration ran torture prisons, and then Obama came in and closed them. Does the agency has the power to decide for itself whether it needs things like that and whether it’s ethical to use them? RM: That’s a great question, Sophie. I feel, the intelligence community has a good set of guidelines. It starts with a given set of authorities we have. I other words we can conduct certain activities that we call a ‘mission’ without special authority. For example, the mission of espionage is the core intelligence mission of all intelligence services. We can do that without seeking approval. When we do something like interrogation or enhanced interrogation or have prisons that requires what we call a ‘covert action’ finding, that requires a finding from our Department of Justice that we can do that activity as well as very strict guidelines that are laid out in writing for the agency to follow. And at the times when we run foul of that, when we are accused of crossing the line we are held accountable by whatever standard has been laid out by our Department of Justice and other authorities that are above us. SS: The involvement of government agencies in these presidential elections - starting from the FBI role in the Clinton emails, now the Trump investigation - investigating both candidates and being quite public about it - is unprecedented, isn’t it? Why has the intelligence community taken on this visible and political role this time around? RM: I agree with you actually, I find it very regrettable. I’m very concerned about the politicisation of intelligence. I do agree it’s happening to some extent. I think, the FBI and the CIA are still very reliable organisations that are following their guidelines. I still have complete trust and confidence in the organisations. But you’re right. The questions do arise. And it’s because of the highly politicised nature of our domestic politics right now - between the Republicans and the Democrats, between those who support the president and between those who don’t support the president. So I agree, it’s a very concerning time. And I think, it’s going to be a time when we in a way redefine our limits - what is the proper role of the CIA and the FBI in our domestic affairs? We’ve learned in our history in the past that we should stay out of American politics. SS: The House Intelligence Committee has released the Republican ‘Nunes’ report’ which contains allegations that FBI misled the judge in obtaining permission to spy on Trump’s presidential campaign. This report has already been branded ‘inaccurate’. Is it part of the blame game or is there some substance to this? RM: Personally I think, it’s the blame game. That’s my personal view: the Nunes’ paper is a Republican version of cherry-picking the facts as they choose to present them. Now I understand there’s another version circulating - the Democratic version. I frankly find the whole process not something I’m proud of as an American. I prefer to see both parties sit down and discuss these things, not in the public eye, without declassifying or releasing the classified information. All of that isn’t something that I, as an American citizen, would endorse and say is a good thing. SS: Especially with Trump’s election things haven’t been like they used to be before. From what I understand about the American system, the nation’s foreign policy is largely decided in the White House and the State Dept., and Congress and the Senate are more preoccupied with internal matters. This time Congress is so active in pushing its foreign policy vision on the president. Why? RM: Well, I think, that’s true generally, Sophie. And we also have the National Security Council. And unlike Russia and China and other countries that have more continuity in foreign policy work and making, we don’t do largely to the political nature of our system. We run in four-year cycles with a large part of it which is consumed with electioneering and campaigning. I think, that’s a weakness of our system. I still believe in the representative government idea that we sacrifice this continuity and stability in our policymaking. It is our vulnerability and weakness. You can really see it right now largely because we are dealing with unprecedented issues that we’d never had to consider. We never had such an aggressive intelligence attack, if you will, on the American democratic institutions and our election process that we just had in the previous election. That has caused a great deal of this, I think, soul-searching inside the US. SS: We’ve now come to the issue of Trump-and-Russia story. You said yourself there’s no hard evidence yet of Trump’s straight-on collision with Russia. So why does the public believes it to be fact and the media in America report it as fact also? RM: I hope the American people and the media don’t believe it as a fact, Sophie. I see it as the facts are clear that for whatever reason, and I question why the Russian intelligence services attacked our system so aggressively. But I think that is a fact. And I don’t think that’s deniable. The question that is ‘what did that do’ and ‘what impact did it have on the results of the election’ and ‘for what reason did the Russian intelligence conduct that activity’. I don’t have the answers to those questions and I won’t speculate because I think that would be irresponsible. I think we have to determine what happened and then decide what happened on the basis of the evidence. And I don’t think we’re there yet. SS: But here’s the thing - I don’t know that anyone has presented the evidence. And then the facts have been presented to the American public by the intelligence agencies. American public has been misled, intentionally or not, by its intelligence community many times. I’m thinking of WMDs in Iraq, for instance, since the consequences of that are still felt 15 years on. SS: So why the wholehearted faith in what the intelligence is telling them about Russia now? You’re saying it’s a fact. But everytime Russia tells them ‘show the facts’ they are unable to provide them and prove, just like with Iraq. RM: I think, it’s illegitimate accusation, Sophie, to the extent that it puts pressure on the US intelligence community to do something, it’s hard to do, which is to present, if you will, the secret facts or the secret story because I don’t have a reason I need to know that as a retired CIA officer. However, if they do present the facts, there’s a risk of compromising our sources and methods which would not, of course, be good. So the question is - how much evidence should be provided to the American people. I’m personally (I stress this as my personal view) an advocate of declassifying as much information as possible and presenting it to the American people and the Russian government. I think we really need to initiate a process that would negotiate an end to this kind of this aggressive cyber hacking and interference in one another’s domestic affairs. If President Putin believes the US is interfering in Russia’s domestic, internal affairs, it’s not a good approach to interfere in our domestic affairs in order to get us stop doing this. So I think, it’s in the interests of both sides to sit down and talk this over and try to avoid a repetition of what happened in 2016 in the future. SS: Mike Pompeo has just recently met heads of Russian intelligence bureaus - “to protect the American people”, as he put it. So, hostile rhetoric, threat-naming, sanctions aside, Russia and the US are still pragmatic enough to work together on some issues, right? RM: That’s right, Sophie. It’s really important that professionals in the intelligence business not cease cooperation even at the hardest times. We have a long history between the US and Russia that goes back in the Soviet days, of setting aside our most grievous complains against one another and cooperating in areas like counterterrorism, and sometimes on counterintelligence and other issues that impact our bilateral relations. I applaud the recent visit of the three Russian intelligence chiefs in Washington with director Pompeo. I think, it’s a great move to reinforce the idea that we must continue to cooperate in the areas of common interest for both countries. SS: Now, obviously, the Congress is up in arms about the Russian-American intelligence chiefs meeting - why would the lawmakers be against this if it does bring tangible results in the fight against terrorism? RM: Well, I know some people in Congress and I interact quite a bit with Congress to inform and advise specifically on the areas that we need to talk with one another to continue keeping both of our countries safe. It’s in American interest to not see any Russians die in terrorist attacks as it is in the Russian interest to prevent any terrorist attacks in the US or elsewhere in the world. So I don’t think there’s any dispute on that in Congress and I think some of the posturing may be political as opposed to substantive. I haven’t heard anyone saying that we shouldn’t be talking to one another on counterterrorism issues. SS: Democrat Senator Chuck Schumer has demanded publicly naming everyone who had contact with the Russian intelligence delegation. Won’t that sort of all-across-the-board disclosure be damaging for the nation? RM: Yes, I think it sends the wrong message. If I were to talk to Senator Schumer I would certainly urge him not to politicise… You talked about politicising intelligence earlier - that would be an example of it. If we don’t do this cooperation between one another in the areas of exchanging information and analysis of the terrorist groups and their activities whether this is in Syria, Caucasus, the US or in other parts of the world, we should all be fired. We have to have the courage to do that. In my experience I was involved in the earliest lays on work between the US and Russia at the time of the breakup of the Soviet Union. And I don’t recall a time when three intelligence chiefs all came together to Washington such as just happened. I take it as a very positive signal of a desire to do more. And I hope both sides can find the strength to do that. SS: Is this just a chance for politicians to be loud and TV-friendly, blaming spies right and left? On the other hand, they must care about the actual issues of national security, right? RM: I hope so, and I have deep respect for Senator Schumer. I would question this based on what I’ve seen in the media. And I hope, behind it all, it’s not seriously questioning why we would be doing it at this time. I would also add that (again, this is somewhat an orthodox view from someone like me) I’m not a believer in applying sanctions to people that are doing their jobs. We have a long history of trying to avoid that sort of politicisation of intelligence. I think, we have to try to find a way to de-escalate the politicisation of intelligence activity. It would help, again, if both sides, particularly in this case I’d have to put more pressure on the Russian side, to stop interfering in US domestic affairs with intelligence activity and that would set a better environment to de-escalate the rising tensions on the political level. SS: But does the fact that Intelligence committees on Capitol Hill haven’t been briefed about this mean that the administration has no trust in Congress? RM: I don’t think I would go that far, Sophie. I think it reflects the very sharp political dividing lines right now in our country - not just between the Democrats and the Republicans, but within the parties themselves. I think, the Democrats are struggling to re-establish their identity and decide what part or wing of the Democratic Party would move forward into the next election cycles. I think the Republican party is trying to decide how much it supports the President. Some do, some don’t as you know, I’m not betraying any secrets here. So I think, there’s conflict, tensions and instabilities within both parties. Again, having watched this for much of my over 60 years, I’ve seen other times in our country when we were seen just as confused and dazed and we generally emerged out of it stronger than we entered that. I’m overall confident that we’ll get out of this phase that we’re in stronger than we entered it. SS: So one terror attack has already been prevented thanks to the CIA sharing intelligence with Moscow and Putin has personally thanked the Americans for their help in that. How does that work with the intelligence agencies - how do you cooperate on some matters when there’s general mistrust and hostility? RM: I think it’s a great question. And I love this question because it gets to the heart of where we’re, where, I hope, we’re and where we strive to be. Even on the days we don’t reach these ethics, I would call it, of intelligence our basic model, standard, if you will, is we have a duty to warn. We have a duty to warn anybody anywhere in the world if their lives might be threatened by terrorist activity. And, of course, in my time at CIA working in counterterrorism I personally instructed my officers to analyse and then provide the Russian government with the information that, I believed, prevented attacks on Russian citizens during my time. So I consider it one of the best days any time we helped one another prevent attacks where people might be killed obviously. That’s a great story and we’ve done it before. Fortunately, on this occasion there’s a little bit of recognition that it happened and that’s a good thing. SS: Do you think, the recent Pentagon military doctrine shift from the war on terror to great power rivalry - with China and Russia given higher priority now - mean that the CIA’s anti-terror effort will falter? RM: I don’t think so, Sophie, because terrorism is not going away. In fact I’m a little worried right now because every time there’s been a relative lull in activity such as we’ve seen since the reduction of conflict in Syria recently, there’s been a rebound and terrorists have emerged in a new form. So I’m not in any way a believer that we’ve passed this threat of terrorism. I think, at the same time the great power rivalry doesn’t necessarily imply that we’re enemies again, or that we are back to the Cold War. I think in a way, if you apply this idea of rivalry to China or Russia, it’s a recognition that both countries should be taken seriously. Their interests are sometimes a threat to the US. But I would describe it more as a competition than adversarial. SS: I heard former CIA officials lament the fact that the agency has fewer resources now than during the Cold War - but does new technology like the NSA surveillance mean that fewer people are needed at the agency anyway? RM: I’m generally not a person that believes that intelligence resources are insufficient. I think we have plenty resources and we have to be smarter in how we go about things, as you indicated. We can leverage technology as a force multiplier that makes us stronger. There are other ways to do it too. I don’t think numbers is often a way to attack a problem. I think, we need smart people, we need people who have the authorities they need, the resources they need to do their jobs. But I don’t think the numbers indicate whether we have enough coverage. In other words, I believe the intelligence community… We have 16 different intelligence entities within what we call intelligence community. We have plenty of capability. I think where we need more efforts is in how we decide what we do and then be more efficient in going about our missions. SS: Will the agency have less need now for gathering old-fashioned, Cold War-style human intelligence, like, I don’t know, talking to someone in a bar, or infiltrating a guerilla camp? Can tools like hacking, eavesdropping on phone conversations, intercepting emails, spying with drones, replace the human intelligence component? RM: You’re talking to an old-school person. I don’t think I have to reform my thinking at this point of my life. I’d have to answer to you by saying there’s always room for old-fashioned espionage. Spies go back to biblical times. As long as there are humans on the Earth there’s a need to know what our, if you will, competitors and adversaries are thinking. And human spies will never be replaced by cyber or hacking, drones or any other technology. In fact, in 1990s, in my view, the US intelligence community became too enamoured with what I call ‘national technical means’ whether that were satellites or other things to replace human intelligence. We thought the world had changed after the collapse of the Soviet Union. And it hadn’t. We’re still living in the world I was born in 1954. So I believe the answer to your question would always gonna need understanding of adversaries’ and even someone of our friends’ plans and intentions because by having that knowledge we’ll make better decisions. SS: And also I feel like more technology progresses, typewriters and old-fashioned letters are the safest thing out there still. SS: Rolf, thank you so much for this interview and this wonderful insight. I wish you all the best of luck. 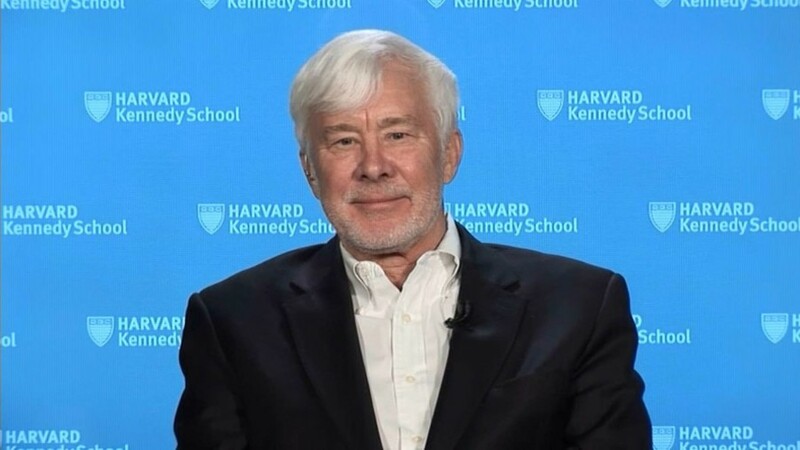 We were talking to Rolf Mowatt-Larssen, two-decade CIA veteran and former Moscow station chief about the CIA relationship with the Trump administration and its role in today’s chaotic world. That’s it for this edition of SophieCo. I’ll see you next time.